We are designing an open-source opt-in app for small publishers and news organizations. RJI asked we write a post introducing the project and talk about early usability testing. This was originally posted on the Reynolds Journalism Institute at Mizzou, and Jennifer Nelson was awesome enough to let me share it here. In our research phase, we learned that many small publishers have a hard time gaining a large-enough initial cohort of meaningfully engaged users to monetize through membership, subscriptions, or donations. In order to begin converting to subscription or membership services, publishers need a significant user base and dataset to make that jump. We have started designing an opt-in app, an “opt-in” being a call-to-action to sign up for either a newsletter or join a site that are strategically positioned to — well — get folks to sign up. You’ve seen them before: These are those cards that slide-in or slide-up from the bottom right on the web, or that popup in your face just as you start reading content. In working on a tool with the end-goal of making its users better informed through good data, we’re doing our best to walk the walk. Our front-end engineer Al Delcy mocked-up a high-fidelity prototype and user flow summarizing our best-guesses for what early adopters might want and how their setup, onboarding, and use might look, which we then turned over to the Information Experience Lab for usability testing. I’m oversimplifying, but IE Lab identified some great opportunities to improve labeling throughout the app — including the name we were rolling with (! ): “ListBuilder” — as well as general usability. The overall scores on the System Usability Scale (69.25) and the Usability score (69.69) are average, while the below-average Learnability score (67.50) indicated that the design from this first prototype was more complicated and jargon-heavy than it had to be. 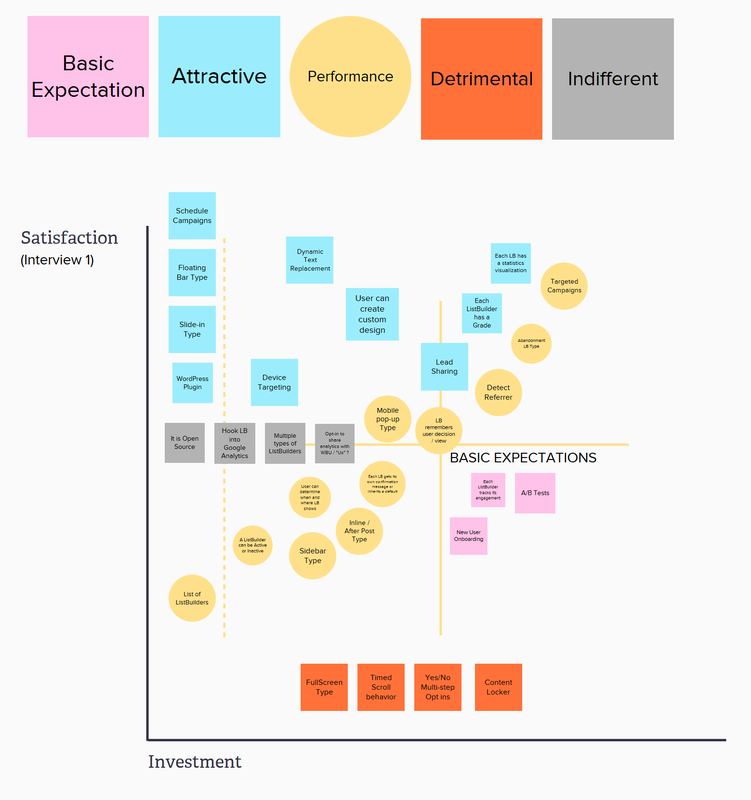 The results of this method — called the Kano Model — can then be mapped to a graph that measures customer satisfaction for each feature. 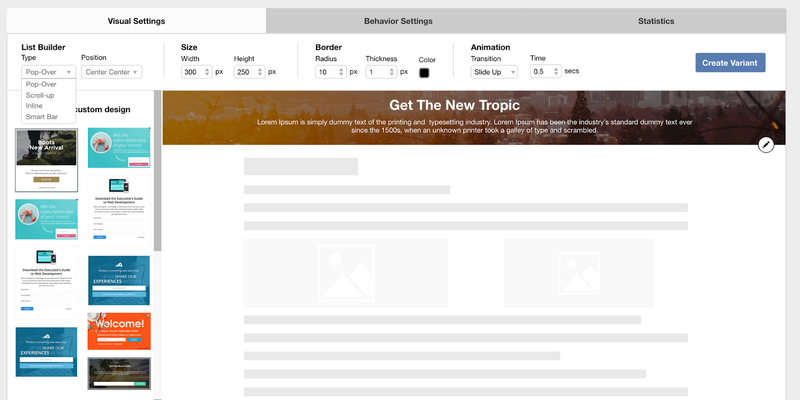 At a bird’s-eye view, we’re then able to get a feel for a net user experience: poorly implemented or disliked features pull down the overall value. Common patterns emerge after just a few of these, which we then can — and did — use as a reference to inform our decision about what features our app will have with version 1. This becomes our minimum-viable product. We are able to see which features must make the cut for it to feel complete. We can see which features most excite early adopters, and which features that — even if they’re super cool — require way more investment than we can make to pull off correctly. Now that we have great feedback and direction from our users about what they need and how they want to use this tool, we can focus our effort on making the minimum-viable product (or MVP) to meet their needs. Our next step is to build that MVP using the insight we gained from these user tests, then IE lab will help us test it again throughout development. These cycles repeat until the tool meets the requirements we laid out in our Kano model. Our goal is to have an MVP launched and ready for publishers to try by the fall. Thanks to iterative development and proactive user research, we can have a lot more confidence that we’re building something useful for ourselves, for our partners, and for more small publishers who are seeking to build long-term relationships with their users and a larger base of support for their organizations.